Here are the official group photos - a serious one and a fun one. Thanks to Garry Gay for arranging and taking the photo on the steps of the Nott Memorial at Union College. HNA 2015 haiku poets - "You make me want to shout!" For many of us, our last official Conference presentations were experienced Sunday morning in The Desmond's Town Hall. Here is a tiny Gallery of photos taken while Deborah P. Kolodji and Michael Dylan Welch were at the podium. I was so enjoying the readings of Conference Haiku, led by John Stevenson, that I forgot to snap any photos of that final segment. It seems to be time for me to hand this weblog pulpit back to HNA Headquarters. Thanks for checking in and staying tuned during the gestation, birth and baptism of HNA 2015. (You hopefully missed the actual conception.) s/David Giacalone in Schenectady. The last trolley-ful of HNA 2015 haijin about to leave from Old Chapel for The Desmond. source: American Heritage Dictionary (4th Ed.) Click on image to enlarge. About three weeks ago, anticipating the hearty crowd of haijin that would be collecting at The Desmond and Union College for HNA 2015, I posted the plea "we need a collective noun", and asked for help finding "a good collective noun for a very large group of haiku poets." If you click the above link, you'll see that the posting evoked some interesting and inspired suggestions, but no conclusions were drawn. Today, as HNA 2015 closes, and especially after opening my trusty old American Heritage College Dictionary (3rd Edition, 1993) to the section starting with the verb and noun "troll" and going to "Anthony Trollope", I'd like to nominate the collective noun "trolley": to wit, "a trolley of haiku poets." As sleepy as I am this evening in my cozy Schenectady apartment on Cucumber Alley, I am quite pleased that I don't have to explain things to the bright and insightful haijin who commuted back and forth from The Desmond to Union College for Haiku North America 2015. Naturally, our Comment section is open for your reactions (pro or con), and for haiku, senryu, tanka, renku, rengay, or haibun incorporating the word "trolley." 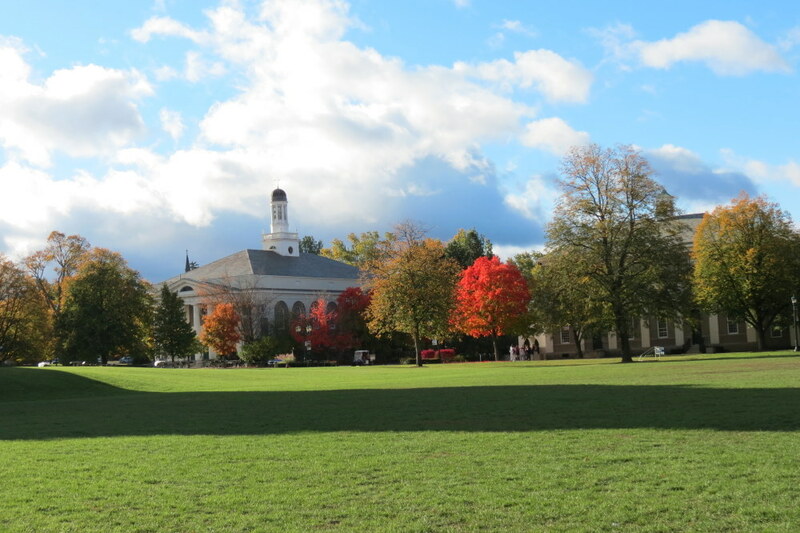 Saturday, October 17, brought more beauty and haikai inspiration to end the Union College portion of our Autumn Term. Union College and Schenectady might be a tough act to follow for Sante Fe, NM, the location of HNA 2017. This Gallery presents photos taken throughout the Union College "classroom [and lunch]" portion of Day Four (by David Giacalone). Like Days 1 through 3, there was plenty of intellectual and visual stimulation, along with haijin camaraderie and conviviality. The following Slideshow presents images captured inside the Nott Memorial, especially the "Colors of Japan" concert presented by The Union College Japanese Drumming Ensemble, Zakuro-Daiko, directed by Professor Jennifer Milioto Matsue. 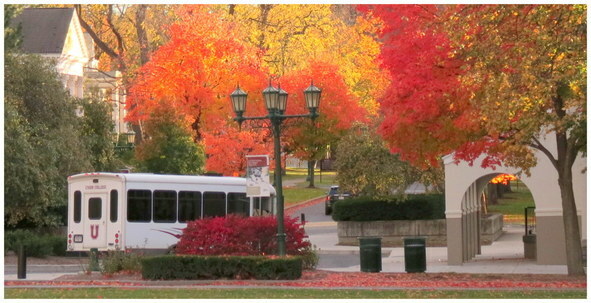 A few ending outdoor scenes are included, paying tribute to the beauty of the Union College campus in autumn. Many thanks to all who came to Union College and The Desmond to help us demonstrate that the Haijin Community is a vibrant (and affectionately-contentious) Reality. Click this link for an article in the Albany Times Union, "Haiku fans flock to Union College in Schenectady," with a slideshow of 11 photos. The pictures are more fun than the text. Wow. What a beautiful day. What a lovely campus. What a great bunch of presenters and attendees. I hope Day 2 of Haiku North America 2015 pleased all of our registrants as much as it pleased me. I still can't decide which collective nouns might best capture our collective presence. It certainly did seem like a Season and Resonance of haiku poets, and a bountiful Harvesting of Haijin. And, here are arbitrary moments from other venues at HNA 2015, day two. My day started here, at my backyard on the Mohawk River in the Stockade, and got better. WELCOME to HNA 2015: Autumn Term!! The Desmond website is easy to navigate. The Desmond is only 10 miles from Union College. We'll be running a trolley service to and from the Desmond Thursday through Saturday. Click here for a Google Map showing the drive between the hotel and the College. If you're still packing, you might want to know that the expected highs for Schenectady and Albany the next few days are upper 50s and low 60s (with lows near 40º), but by Saturday and Sunday the highs may be about 50º, with lows around 30º [click for Weather.com forecast] We will help keep you cozy, and expect the sun and clouds to be engaged in a playful dance. Of course, the Union Campus (and the Schenectady Stockade) look lovely and fashionable in gray, too. Also, as you can see by the map detail to the left, the venues for the Conference are huddled comfortably around a yard/lawn with Nott Memorial at its center. If you have room for a foldable umbrella, packing it might be prudent, and make you popular with haijin friends. ​STOCKADE GINKO - Rain or Shine update: At this point, Friday seems to be the only day when the weather might disrupt outdoor activity. However, should the weather be too inclement for a leisurely stroll through the Historic Stockade at the end of the afternoon on Friday, we're pleased to say that the Union Trolley will take us for a slow, riding-ginko tour of the Stockade, with commentary by me, David Giacalone, that may be occasionally senryu-inducing. Learn more about the Stockade, with lots of fall photos, here. And click here to see its Riverside Park (along the Mohawk River) in autumn. Note: Arthur's does not have a liquor license, but diners may bring wine or beer. I plan to bring a small supply of "homestyle", upstate New York, Italian red table wine to share. The Program that all registrants will receive this week concisely states: "Visitors' Parking is available only in the Nott-Seward Lot." Here's a bit more detail on parking for those who will not be using the buses provided from The Desmond to Union College. There is only one lot where visitors (persons other than Students, Faculty, Staff) may park on the Union Campus, and that is the Visitors' Parking Lot located at Nott Street and Seward Place. As this map shows, the Visitors' Lot is in the northeast corner of the campus, and it can be accessed from both Seward Place and Nott Street. The best way to reach the Visitors' Parking Lot when coming from The Desmond is by taking Union St. to Seward Place, which runs between Union and Nott Streets. Union College is about 3.5 miles from where you enter Union Street from Rt. 7. You will pass the Main Gate of the College, stay in the curb lane, and travel a very short distance (past a traffic light at Nott Terrace) before coming to the traffic light at Seward Place. Turn Right (north) onto Seward Place and drive approximately 0.3 miles to the Visitors' Lot entry-exit driveway. [It is narrow and poorly marked, but is located opposite the steeple of St. Anthony's Church (see photo to the right.] If you miss the entry, simply drive the very short distance to the traffic light at Nott Street, turn Right, and then Right again at Gate 5, which is the Nott St. entrance to the Visitors' Parking Lot. 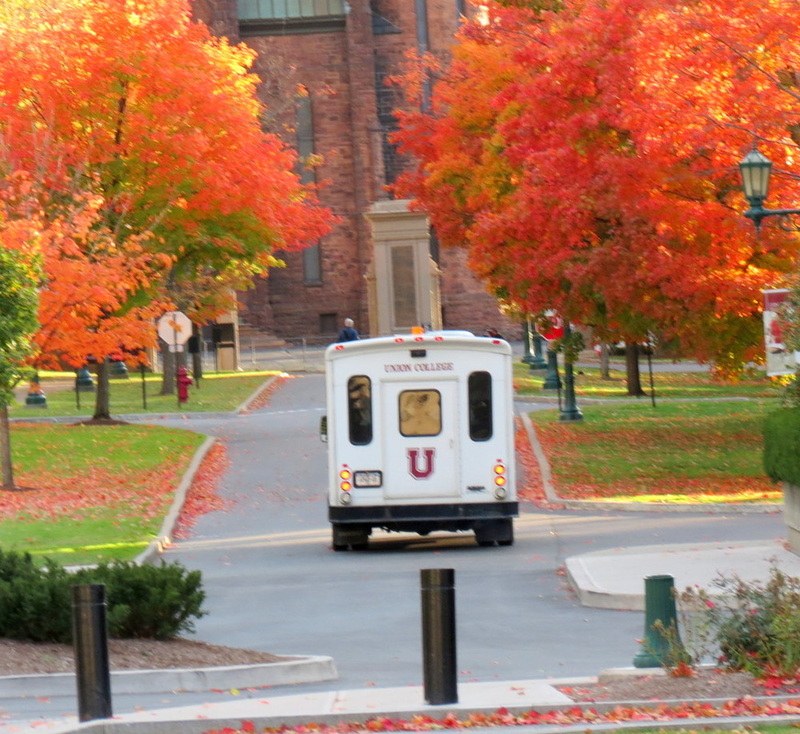 The immediately prior posting, "a Sunday visit to Campus", has photos of both of the Visitors' Lot entrances. Walk up Terrace Lane from the Visitors' Parking Lot to Conference Venues. ​ From the Visitors' Lot, you will walk up Terrace Lane past a row of buildings. When you reach the corner with North Lane and look to the left, you'll see the Nott Memorial and many other Conference venues. There is a map at page 27 of the Conference Program that shows the most relevant portions of the Campus. Street Parking. There is some meter-free parking along the east side of Seward Place and between Seward Pl. and Gate 5 on Nott Street, if the Lot is full. Please do not count on finding a space, but early birds might be successful. Return to Desmond. The best way to return from there to The Desmond is to drive back up Seward Place (south) toward Union Street, where you will turn left on Union and head back 3.5 miles to a left at Rt. 7. Directions from the Desmond: Registrants with vehicles can obtatin a sheet with directions from the Desmond at the Registration Desk (or ask John Stevenson). Also, Click Here for a Google Map showing the drive between the hotel and the College. There are contact numbers on the last page of the Conference Program. An October sunset on the Mohawk near Riverside Park, and the Schenectady Stockade. ​p.s. Speaking of unauthorized arrival and overtime visitor parking, Happy Columbus Day [a/k/a Italo-American Day]!